Boehner acts as if he has a mandate equal to that Obama and Senate Democrats. But Americans gave Democrats a 1.1 million vote majority in the overall House vote. House Speaker John Boehner has grown increasingly belligerent in his “fiscal cliff” fight with the Obama administration. Struggling to hold together a caucus that never really respected his “leadership,” Boehner is trying to rally his troops by ripping President Obama’s supposed disregard for Republican control of the House of Representatives. It is unlikely that the president and his aides have forgotten that Boehner and his crew continue to control one chamber of the Congress. But they also recognize that President Obama won a clear mandate—a 332-206 advantage in the Electoral College, a 4.7 million popular vote margin for a 51-47 percent victory—on November 6. In July, Boehner said the November 6 election would be a “referendum on the president’s economic policies.” On November 6, Obama won that referendum. The president was not the only winner. Beyond Obama’s personal mandate, Democrats can point to a clear signal from the voting for the US Senate. The Democratic caucus added two new members—despite the fact that the pattern of contests was overwhelmingly favorable to the Republicans—for a clear 55-45 advantage in the chamber. Notably, the Democratic mandate extends to the House. How’s that? Doesn’t John Boehner have a mandate of his own? Not if we're counting actual votes. In the 2012 voting for US House seats that formally finished Saturday with a runoff in Louisiana, 59,262,059 Americans voted Democratic, while only 58,105,500 voted Republican. It is true, of course, that Boehner and his caucus control the majority of seats. While their numbers are diminished from where they were in 2010, the Republicans still maintain a 234-201 advantage in the chamber. But that advantage in not based on the popular will; it is based on the manipulated maps created by the redrawing of congressional districts following the 2010 Census, and on the fact that Democratic votes are concentrated in urban and college-town districts, as well as those with substantial minority populations. While the maps didn’t favor the Democrats on November 6, the voters did. Indeed the national popular-vote margin for the Democrats in the race for the House was substantial: a 1,156,550 advantage. It has been seventy years since the party that controlled the Congress did not win the most votes. Usually, the party that wins the House wins it with a solid popular-vote majority—even if the president is of the other party. Consider what happened when Democrats won control of the House during George W. Bush’s second term. They prevailed in the 2006 elections by 6.4 million votes. Nancy Pelosi and House Democrats did not just win control of the House in 2006, they won an overwhelming popular-vote mandate to challenge a sitting president of the other party. 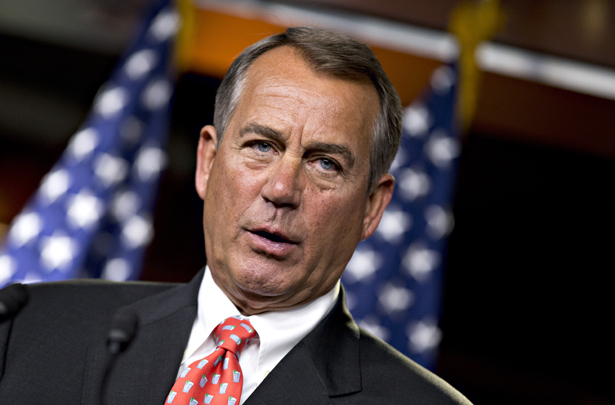 John Boehner and House Republicans won no such mandate on November 6. In fact, they lost the popular vote, and with it the claim that President Obama—who so overwhelmingly won the popular vote—should bend to Boehner’s belligerence. In hopes of winning a presidential mandate in 2016, Republicans are attempting to gerrymander the electoral college. Check out Ari Berman's coverage here.